The discussion about the need for a year-round multi-day farmers’ market in our city has been going on for years. Calgary has several such markets (we’ll leave their tendency to be a one-stop produce shop aside for the time being), but neither the Old Strathcona Farmers’ Market or the City Market have been able to meet this demand. Enter a new player: Bountiful Markets, to be located on the south side at 3696 97 Street. Features include an ethnic food hall and space for 140 vendors. Riverbend Gardens has already signed on as a tenant. They hope to open in May or June of 2019. Pink Gorilla Pizzeria, which took over the former Parkallen Restaurant at 7018 109 Street, opened over the weekend. It’s the second restaurant from Mark Bellows and Ryan Brodziak of The Local Omnivore. The Journal has a preview of some of the pizzas available. Also on the pizza front, Artisti Pizzeria opened in Holland Plaza last week at 11998 109A Avenue. Al Centro opened its doors over the weekend, with soft opening hours continuing this week. Find them at 9888 Jasper Avenue. Amore Pasta’s downtown location at 10235 101 Street in the MNP Tower opened today! They had to delay their opening a week due to mechanical issues. A new coffee shop in Jagare Ridge called Caffiend Coffee is opening on January 18, 2019 at 14132 28 Avenue SW.
Gangnam Street Food has delayed their opening to January 24, 2019. Lydia has a photolog of what to expect. Nello’s in St. Albert is opening a location in downtown Edmonton in the space formerly occupied by his father’s restaurant, Il Pasticcio (11520 100 Avenue). Some may remember back in 2013, Nello’s tried their hand at a space in Grandin (now The Butternut Tree), but was unsuccessful. The brewpub that will open in the former Characters space now has a name: Campio Brewing. Ritchie has developed into a hot neighbourhood for new food shops over the past two years. Another business to join the fray – Kind Ice Cream, which will offer small batch ice cream (including vegan options). They hope to open in the spring. Solstice Seasonal Cuisine is closing on February 16, 2019. The owners are looking into opening a new concept in the space by the end of the year, but in the meantime, Solstice will still be offering their food via Skip the Dishes, and use the restaurant as an event space. The downtown location of the Three Amigos has closed. Otto is hosting the next Swine & Dine dinner on January 31, 2019. Tickets for the 4-course meal are $55. Tickets to Avenue’s Best Restaurants event on March 18, 2019 are now available. They are $50 each. The Edmonton International Beerfest sets up shop at the Shaw Conference Centre on March 22-23, 2019. Advance admission tickets are $19. Twyla raved about the food and drinks at Partake. Graham was less than impressed with Chef Hung’s Taiwanese Beef Noodles. 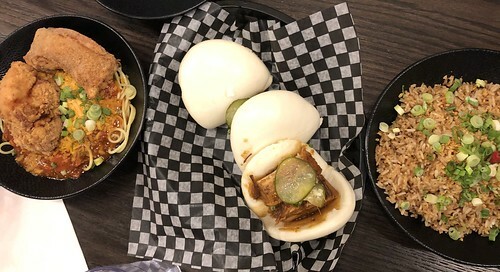 The Journal covered Chinatown Dining Week, which runs January 17-27, 2019. In case you missed it, The Yards selected the winners for their forth annual Best in the Core awards, which features many hidden and not-so-hidden gems in Downtown and Oliver. Chef Ben Staley’s previous restaurant Alder Room was featured in Truth, Love & Clean Cutlery, a “guide to the world’s truly exemplary, organic, sustainable, and ethical restaurants”. Love Pizza has opened up their business to franchise partners. The latest webisode of Fast Food features Filistix’s Ariel Del Rosario’s chicken and pork adobo. Chef Steve Buzak of the Royal Glenora Club placed second along with his teammate in an international ice carving competition in Harbin, China. The newest episode of The Edmonton Community Foundation’s Well Endowed Podcast features an interview with Jon Hall and Twyla Campbell. They discuss the biography of Chef Gail Hall that they published late last year. Our Chinatown Dining Week team met at Kanto 98 St. Eatery last week, where I tried their incredibly addictive garlic fried rice for the first time. It won’t be my last time. 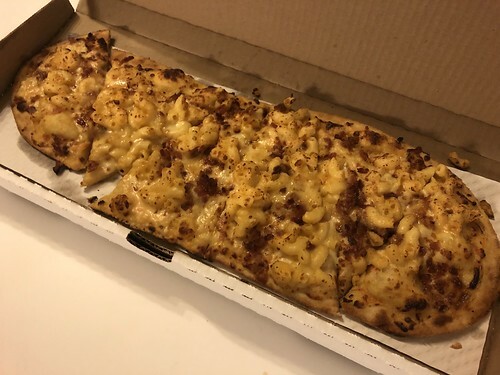 It was definitely a Love Pizza kind of night on Friday – Mack and I have been looking forward to the return of the mac & cheeza for almost a year! It was just as delicious as we remembered. Mack, Emily, and I stopped in at Al Centro on Saturday on our way home from the City Market. 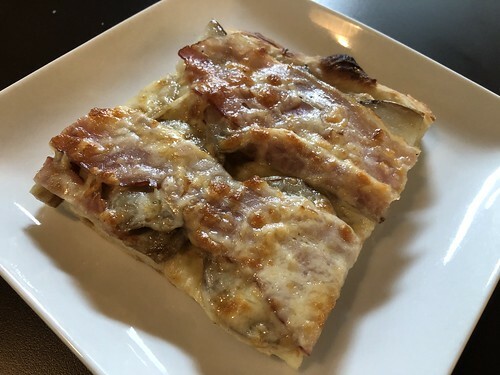 They were clearly in soft opening mode, but we decided to sample one of their pizzas on offer – they have the distinction of being Edmonton’s first Roman pizza bar. The slice was just under $6, which was on the pricey side, but we did really enjoy the crust – it held up nicely and had a great chew. 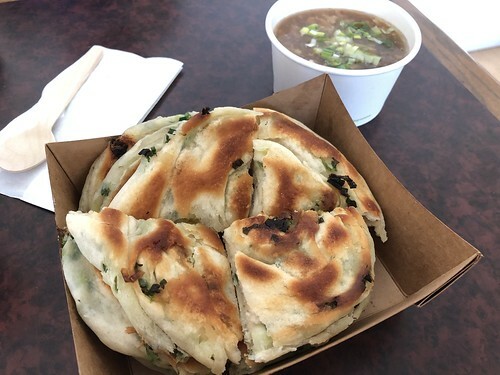 Heading to Deep Freeze on the weekend was a good excuse to finally visit The Green Onion Cake Man! We tried their hot and sour soup and of course their namesake item. The shop has added even more items since Linda reviewed them in the fall – check out the full menu. This isn’t “what I ate” so much as a “where I could eat” – has anyone else noticed that the Courtyard Marriott has winterized their tables overlooking the North Saskatchewan River? 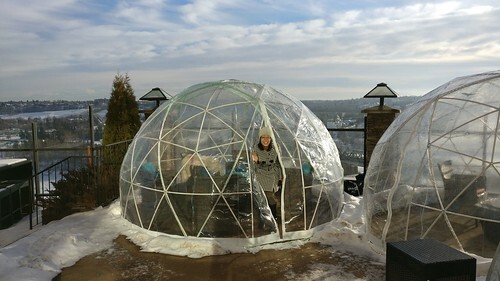 I spotted these a few weeks ago on the funicular, but didn’t have the chance to check them out until the weekend. They can seat up to six, and there are blankets for warmth. Staff weren’t certain they’d hold up on very cold days, but on sunny afternoons, they definitely trap heat. Worth a look for those seeking winter patios!